What if Chelsea were a ‘two-man team’? Much talk already this season about Liverpool being a “two-man team”, ie. Steven Gerrard and Nando Torres. So far we’ve done Arsenal, Aston Villa, Birmingham City, Blackburn Rovers and Bolton Wanderers. Today, after a wee sabbatical, it’s the turn of the mighty Chelsea. I see Michael Essien and Frank Lampard. So no room for JT or the Drog in this elite unit. This is probably the toughest yet. It’s definitely between the four of Essien, Drog, Lamps and Terry. I’d go Essien and Lamps. If you take them out, Chelsea are in real trouble, whereas they could probably replace JT (Alex) or Drog (see against Wolves). Hmmm…. such as a brilliant squad chelsea have, it has to be JT and Drogba. Frank comes a very close third but has too many off games for my liking. The only person in the side though who cannot be replaced is Cech. Tough one this! has to be drogba and a.n. other. do people realise that essien missed september to mid february last season which culminated in chelsea finishing 7 points behind the team from the borough of trafford. 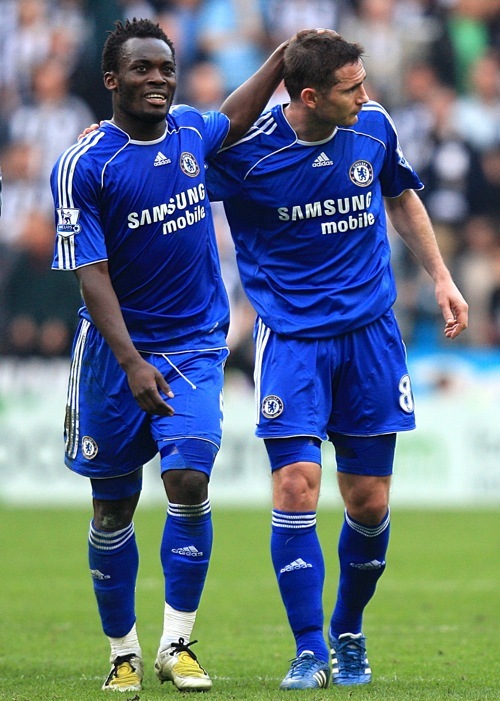 so i would say drogba and essien. How stupid is it to choose two players from about 11 who are all important. You could choose Cech, or Bosingwa, or Terry, Lampard, Drogba, Ballack, Essien, Mikel, A.Cole or even Anelka. This two-man team article needs to be killed off now, it got silly when you started on Arsenal as a two-man team. Sure, Liverpool may be all about Torres and Gerrard, but what about Benayoun or Reina. No team is a two-man team, so please stop this stupid article. WELL I WOULD SAY ESSIEN AND JHON TERRY FOR THEY COVER THE TEAMS BACK THOUGH I AM A VERY VERY BIG ADMIRER OF DIDIER HE IS MY BEST PLAYER IN THE WORLD. LAMPARD BALLACK AND DECO SHOULD BE REPLACED SOON BY YOUNGER PLAYERS. LAMPARD AND JT!!!! THEY’RE DEF. NO. 1!!!!!!!!!!! it would be da case of de reds….livpool.but che s not da red its da blue if u remove ne plyr frm da main squd de r still stronger dan before!!!!!! without doubt jt & frankie boy jnr are the back and front bones of the mighty blue army….chelsea for the treble…come on chelsea!!! JT is absolutely irreplaceable, he not only is the greatest defender but also is a brilliant leader. Most of the chelsea’s success is down to him. Lampard, for now, seems irreplaceable, but I think within 2 years, his place is most likely to get shattered….